It’s no secret I like fragrance in the garden. Actually, I like fragrance in my house too. And on my body. 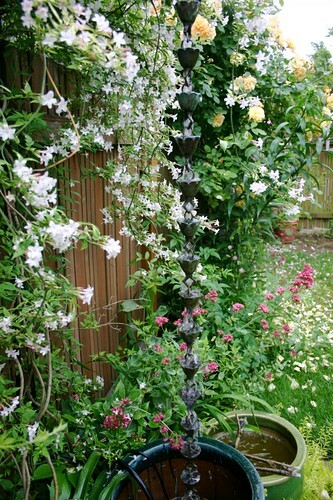 But fragrance in the garden is a decadent element I design space for. 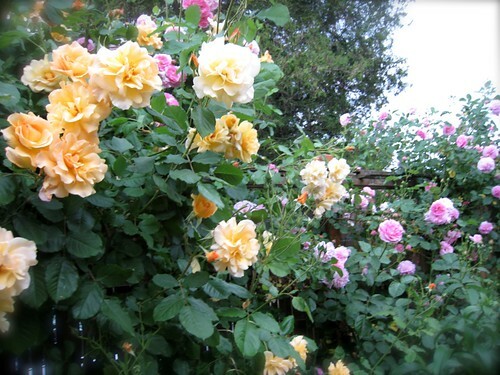 So it’s no wonder that The Wall of Scent is in great bloom at this very moment. It wasn’t named The Wall of Scent until right now. But the sensory experience is obvious. Old fashioned roses, one smelling like sweet rose water, another like spicy pure rose, and one Chinese jasmine absolutely blooming its head off. I stood here the other day at The Wall. I forced myself to just stop. Stop the tasks, the to-dos, the client calls: stop. This jasmine has come into its own this year. You know the saying first year they sleep, second year they creep and third year they leap? This must be the jasmine’s third year. It has leapt and scrambled all along the fence, covering the hardware for the rainchain, and now it’s in full bloom. How do you describe, in words, this scent? It’s the purest of jasmine, the undertone of 75% of all women’s perfumes, I would assume. But it’s not at the high note of the scale. It maintains a musky deep accent, a serious fragrance that nicely balances the sweet rose bloom notes bouncing through the same air. Together they blend into a wonderful late spring experience. They draw me in and welcome me to sit and take them in some more. There’s The Wailing Wall, and then there’s my wall. And it smells delicious. Last week, the Portland area experienced a strange storm. Wind whipped through the garden, the sky turned a dark green grey, and I sat in the backyard taking it all in. Until the thunder began. 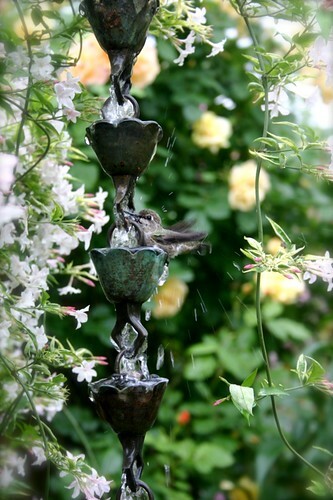 I love your photos...beautiful shot of the bird taking a bath in the rain chain! I too am a scent junkie and have got roses and a star jasmine strategically placed in the front-door entry, plus heliotrope and sweet peas. Can you ever have too much perfume in the garden? Lelo - your garden is such an inspiration! Each one of your garden posts reveals another little piece of jaw drop beautiful. Thanks so much for sharing. One of these days I hope you'll invite me to visit your garden. It looks so beautiful. I've been growing honeysuckle along my back fence for the last few years. I bought the plant at a nursery "going out of business" sale. It was two sad little vines gasping for life--cost me 50 cents. I nursed it along to a vigorous state. In fact I was planning to prune it some last weekend. But the Friday storm unleashed it's fragrance into my garden and I couldn't bear to touch it. I'll probably prune it tonight after I do my evening weeding rounds. I'm looking forward to the immersion in that gorgeous scent. 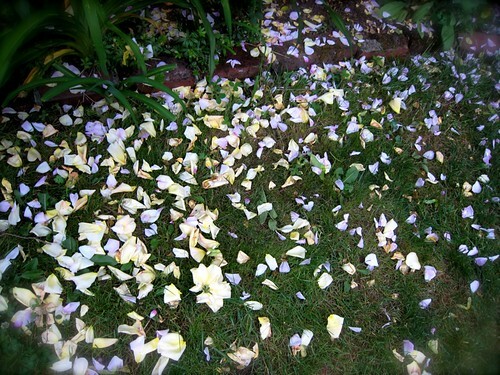 lovely thing storms.... it must have been lovely to see the petals rain down. Gorgeous. And I'm guessing it smells a lot better than the fish emulsion. Wasn't that storm crazy? I ran around putting up all my potted plants, but I never did see any hail up here. Your garden inspires me - I want to have yummy smelly plants all over! That shot of the bird spraying water droplets is awesome! 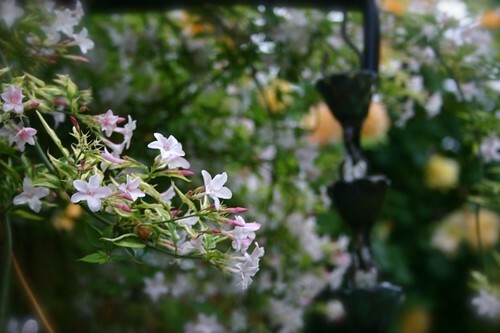 I love the scent of jasmine but also remember the smell of wild honeysuckle from when I was a child. Intoxicating! Flower gyrl - Oh heliotrope! Thank you for reminding me of that wonderful scent. Yummy. Carla - Check your Facebook mail. Cat - You are gardening like crazy in a climate I could barely get myself from an air conditioner in. I'm glad you helped my brother to finally see the way. jaibone - it's been such a stormy late spring here, hasn't it? I'm beginning to think we're in the midwest. Syd - I did think about that the other day when I was spraying that fish emulsion. I didn't spray the roses in case I cut them and brought them inside. I would have had a big stinky fish bouquet. Jacquelyn - It was crazy and we should be thankful we didn't have hail. It would have taken out our corn! Lisa - Don't you love it that scents from our childhood stay with us like that? Thank you for sharing. Totally jealous of your fountain. Such pretty flowers, too! I'm jealous too! I miss my jasmine and heliotrope!!!! Waaah!! Do you have any more photos of the bird bath? That's really beautiful. 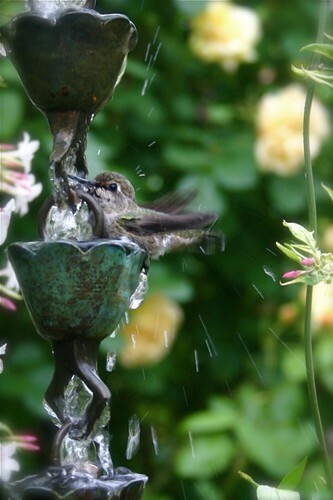 Those hummingbird shots are amazing. I love those little birds. Thanks so much for capturing and posting those photos! Hey, i noticed you have a rain chain. I want one so bad! Do they gingle when the water runs over them? thanks so much!